If you're serious about your power tools, you have already decided that an electric chainsaw won't provide enough power for the jobs you have in mind. 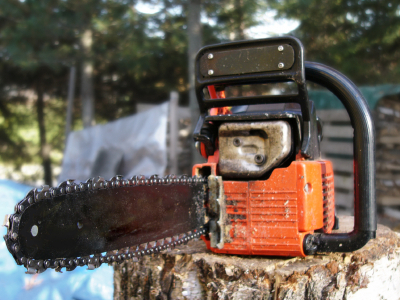 Using a chainsaw regularly, whether it's on trees, shrubs, or any number of woodworking jobs, requires the power a gas engine provides, and also gives you the added benefit of being able to move around without the restrictions of power cords. Gas powered chainsaws also tend to be a bit more expensive than their electric cousins, so choosing the correct saw for your application is important. While the best brand of chainsaw is open for debate, there are number of technical specifications that should be considered no matter the brand you eventually decide on purchasing. The first thing you have to determine is the engine size, also known as engine displacement, you need in a chainsaw. Obviously, larger engines provide more power and are generally required for bigger jobs. Most homeowners will require a saw under 60cc, and the most common homeowner saws will be between 30cc and 45cc (such as Stihl's line of homeowner saws). Lower engine displacements are generally used for trimming and pruning, and higher engine displacements can be used for small to medium trees and cutting firewood. Bar length is another measurement that is typically determined by the type of work you're doing. Homeowner chainsaws are usually available with bars that range between 14 and 18 inches. If you won't be cutting trees or logs, you should make sure to go with a smaller bar. A 14" bar will not only minimize chances of injury, but it will also be easier to handle which will allow you to get the job done more quickly. There are two different kinds of chains that you need to be aware of when purchasing a saw: full-chisel teeth and semi-chisel teeth. Full-chisel teeth are great for quickly chipping away large amounts of wood, but this causes them to become dull rather quickly so it's best to use a full-chisel chain on woods such as pine and cedar. The opposite is true for semi-chisel teeth. They won't dull as quickly and therefore can cut through hardwoods such as maple and oak for longer periods of time (though each individual cut may take a bit longer). Finally, you'll want to consider the safety options that your saw offers. If you're a novice chainsaw user, you should make sure your saw has features that will protect you from injury. Look for a chain break lever, which can be combined with the front handguard so that if for any reason the chainsaw kicks back, the guard will hit your hand and stop the chain. Other safety features to look for include a safety throttle, chain catcher, and stop switch. Wikipedia offers a good overview of many of the safety features available on a chainsaw. We hope this gave a good overview of the features you need to look for when purchasing a gas powered chainsaw and will help you along the way when you’re talking to salespeople. Finally, remember to purchase the proper safety gear before you start working and you'll be on your way to a beautifully kept yard! HLSupply.com sells aftermarket chainsaw parts for a chainsaws from Stihl, Husqvarna, Partner and many more. Visit our store for the best deals on power tool parts and equipment.